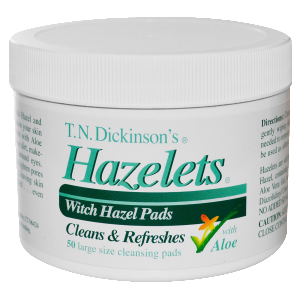 Hazelets Witch Hazel Pads are gentle astringent cleansing facial pads with witch hazel and aloe. This mild and non-drying formula is well suited to sooth, condition, and tone the skin after shaving or to clean away excess oil and dirt throughout the day to help bring forward your Impeccable look. Ingredients: 3”round cleansing pads with witchhazel. These large sized pads contain no artificial fragrances or dyes.